Today, together with a few thousand people, I attended the "mass photo gathering in defence of street photography" in Tafalgar Square. A protest in response to apparently haphazard way in the which the police apply S44 of the Terrorism Act. Recently there has been several high profile cases of people getting stopped simply because they are taking pictures. Several years ago before this become so obvious, I was also stopped and searched and my details were collected, simply for walking around Whitehall and taking pictures. Months later, it was in London Bridge station that a policeman asked me to delete a picture of a hoarding I had just taken with my mobile phone for the reason that it is not allowed to take pictures of the structure of the station. Strangely nothing was said to the person using his camcorder a few metres away. 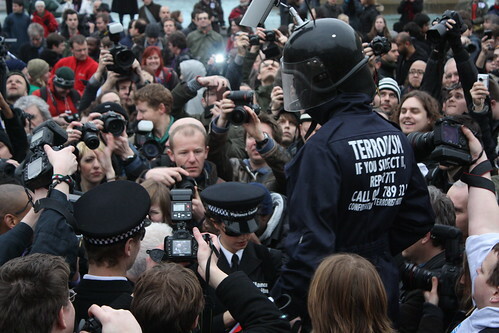 Recently the European court of human rights ruled that the use of counter-terrorism stop and search powers on photographers and peace protesters was not "sufficiently circumscribed". New guidelines were issued by the Met with ostensibly little effect. The government is appealing the decision. In addition to taking lots of pictures, I got to chat and shake hands with a Baroness (Sarah Ludford MEP whom I recognised from another protest outside the Polish embassy, in May 2007) and also had a chat with 3 drag queens. Who says I don't lead an exciting life?! My pictures of the event can be seen here. The general photopool for the event is here. Better late, than never, they say. Well, perhaps not in this case. This week, I finally got round to doing something I have been meaning to do ever since the exhibition opened and which I was very much looking forward to, due to my strong interest in the Aztec civilisation. I went to see Moctezuma, Aztec Ruler at the British Museum (BM). It closes next Saturday, so it was indeed very late but it was also rather disappointing. My first big issue about the exhibition is that, unlike the fabulous Hadrian exhibition of last year that did exactly what it said on the tin, this one is not really about Moctezuma. Despite the fact that a press release by the Museum claims that the exhibition, which is the last in the series "exploring power and empire", "is the first exhibition to examine the semi-mythical status of Moctezuma and his legacy today", it is not really about him. To be fair there is probably so little reliable information about him (ie information that has not been distorted by the prism of the conquerors' views) that it probably would not have been possible to have an exhibition about him. Similarly there are probably very few objects that have, without a doubt, belonged to him still in existence - a few (stone coffins bearing his glyph) were on display in the reading room of the Museum where the exhibition was located. There is also an obvious need to give historical context to the character, since many people would probably not be aware of it. With all that in mind, we end up with an exhibition about Tenochtitlan (now Mexico City) which was Moctezuma's capital and the place of his downfall at the hands of the Spanish Hernan Cortes, the Aztec civilisation and the conquest. 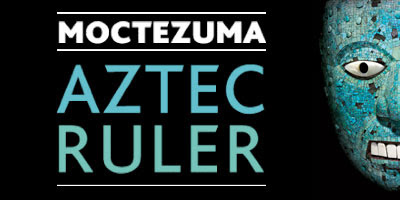 The question is, therefore: why call the exhibition Moctezuma? Another question that could be asked of the BM is why bother with the exhibition at all. The artefacts on display (and some of them are truly stunning) are not very numerous and not very varied - mostly sculptures and too many pictures of objects that are not there. In fact this exhibition, or rather a much better version of it, has already taken place in London not so long ago. It was called Aztecs and took place at the Royal Academy (RA) in 2002/3. In fact, comparing the catalogs for both exhibitions, not only was that one more extensive (there more than double the number of objects on display at the RA) and better focused and structured, the objects on view at the BM seem to have more or less all been part of the RA exhibition. From a curatorial perspective, the exhibition is not really a success either. The white setting is rather bland and unoriginal, apart perhaps from the centre-piece mock courtyard with the four flights of stairs as if at the bottom of four pyramids, which did gave me a momentary thrill. The two films projected on the walls of the room are utterly useless and seemingly devoid of information, although it was nice to have the sound of the wind, birdsongs and other flutes in the background. Most importantly perhaps, the exhibition doesn't seem to be following any truly definite and logical thread. As for the curatorial notes accompanying the objects, they repeat themselves too much and focus more on describing the objects than on explaining their usage and provenance. Perhaps my view is biased by the fact that I already have a reasonable knowledge of the civilisation, but to me the RA exhibition remains a landmark, one of those exhibitions of a life time that people keep on talking about for years. The BM show is no match for that, sadly. If you have not seen it yet and think you should make the effort, your time would probably be better spent on reading Aztec by Gary Jenning. It's a long but enjoyable and incredibly well documented historical novel, which reportedly took 10 years for its author to research and write (no real need to bother with the sequels). Images: Turquoise mosaic mask, c. 1500–1521, Mexica/Mixtec. If you cast your mind to 2008, you may remember that the wife of Northern Ireland's first minister, Iris Robinson, said that homosexuality was "comparable" to paedophilia and a mental illness that could be "cured". Last month, she announced that she was retiring from politics, adding that she indeed knew about mental illness, since she was a sufferer herself. And yesterday, she revealed she tried to kill herself while suffering depression after an extra-marital affair. As Newton Emerson, columnist and satirist for the Irish News, who was discussing this sorry business on Thursday morning (scroll down to 0722) on Radio4's Today, had warned us, there was more to come. The story apparently broke after a BBC investigation on the Robinson couple. The BBC Northern Ireland show, called Spotlight, revealed (iPlayer till 15 january) that Mrs "are you trying to seduce me?" Robinson got sexually involved with a 19 year old man right about the time when she was attacking gay people. As reported in Pinknews, she then "allegedly solicited £50,000 from two property developers to help her lover set up a business. The Northern Ireland MP broke parliamentary rules by not declaring her interest in the business, despite sitting on the council which awarded the money to Kirk McCambley, it was claimed. According to the BBC programme, Mrs Robinson, 60, also demanded a £5,000 kickback from Mr McCambley for helping arrange the transaction." She apparently later asked for the whole money back. See also the BBC News article here. The issue here is that the woman is a holier-than-thou hypocrite. Just imagine her loud righteous cries of youth perversion should a prominent gay politician have been revealed to have an affair with a man 40 years younger! She is a member of a very conservative party. Indeed some of the supporters of the DUP are puritans. She claims to be a devout Christian, guided by god and she went out publicly spouting out some rubbish about gays and claiming to speak the word of god. But how many of the commandments of her god has she possibly broken exactly? There is also now fears that whole story may destroy or at least seriously impair the peace process in Northern Ireland. I would like to ask Mrs Robinson how many of those dreaded gay relationships could claim to such import? How many gay people whom she was prepare to vilify in the media would behave as badly as it is alleged she has? In the end that's another name to add to the long list of gay-bashing Christians who practise double standard, those brave souls that do not fear casting the first stone. In fact there are so many of them that one could be forgiven to think that those people use their loud vituperations as a smoke screen for their otherwise shady and highly unchristian activities. A sort of badge of righteousness that distract the public and the people they are trying to ascertain power over to look too closely are their persona. This post was first published on 07/01/10 in a slightly shorter version when the story was still breaking.